Task Manager shows all the running task on the PC background, which helps users find the causes easily when the computer is performing very slow and noisy. One of the most known troublemakers is svchost.exe, usually presented as Service Host: Local System on Task Manager. When something wrong is going with the Service Host, it takes up huge amount of disk usage, CPU or memory. 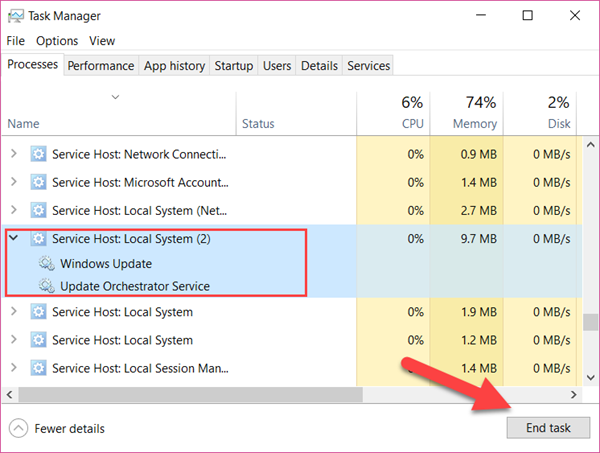 If it is happening to you, don’t worry, please find the solution to fix Service Host: Local System high disk usage problem on Windows 10/8/7 now. What is Service Host: Local System? Firstly, it should be clarified that it is not something related to virus or hackers on your computer. If you still doubt it, feel free to scan your computer with best free antivirus for Windows immediately. In technical terms, Service Host is a collection of system calls that are generic and include multiple threads. The threads are consuming the resources like hard disk, processor, memory, internet, bandwidth, and all other critical sections. In simple words, it is just a process that is out of control and overuse the resources. 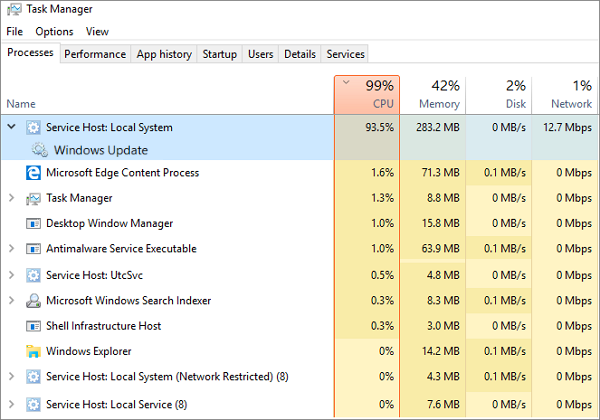 If it is confirmed that Service Host is consuming abnormally high usage of CPU, disk or memory of your Windows computer, please keep reading for the solutions for this issue. It is clean and simple to directly disable and end the task that is making trouble. Open Task Manager by pressing Ctrl + Alt + Delete, then choose Task Manager. On Process tab, expand Service Host: Local System to see the specific eater of your computer disk usage. Select the item, then click the End task button on the bottom-right. Repeat the steps above to end more tasks under Service Host: Local System category until you find the usage percentage is reducing. Is the problem fixed? Not necessary. Even if the disk usage percentage is done, it could rise again when the task is started automatically, which may happen on the next compute booting or sooner. Once the task restarts, right-click it on Task Manager and choose Open Services. Services manager window will open. Locate the service with the same name on the list, then right-click it and choose Properties. On the new window, change Startup type as Disabled, then click Apply > OK.
Windows 10 auto update is frequently reported for causing similar problem. Check a detailed tutorial to disable Windows 10 auto update service. It should be noted that it is very easy to lose unfinished work if you mistakenly end an unsaved task, like Word or Excel. If it already happened to you, don’t hesitate to recover lost word documents with a data recovery software. Similarly, we can also try disabling SuperFetch to fix Service Host: Local System high disk usage error. Press Windows + R keys simultaneously. Type CMD in the box and click OK. Type the command net.exe stop superfetch and hit the Enter key. Wait for few seconds until Super Fetch Service is disabled. BIT, short for Backup Intelligent Transfer, is another service that could cause svchost.exe high disk usage problem. Open Task Manager and click on the Services tab. On the Services tab, click Open Services button on the bottom. Services windows will open. Locate the Backup Intelligent Transfer service, then right-click on it and choose Properties. Change Startup type as Disabled, then click Apply > OK. Disable it to release your hard disk, CPU, RAM, Memory, and other resources. Though we can fix the Service Host: Local System by disabling some, you may find it is at some expense of affecting the usage of other features on the Windows computer. Some may be minor, but some may be critical. Therefore, this method works best as a temporary solution. It is important to do it with caution and try to find the real cause behind. Don’t forget to share your experience or question with us. If you need any assistance for undeleting photos and videos, kindly have a check with an excellent photo recovery tool.